Made by Bally in September, 1977. This is a four player solid state machine. Until recently, this machine held the all-time production record for flipper pinball machines--20,230 were built. It was pushed to second place a couple of years ago by The Addams Family. Eight Ball was Bally's first successful solid state machine. The theme of this game is obviously a pool game. 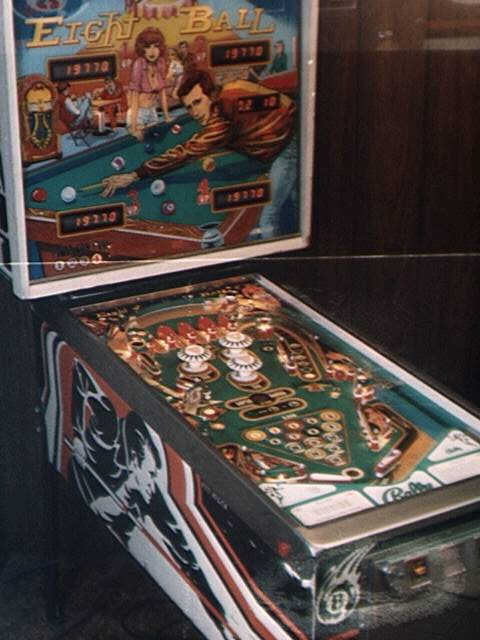 Pictures of this game are found in Pinball 1, by Bueschel, on page 244, in Pinball Machines, by Eiden, on page 44, in Arcade Treasures, by Kurtz, on page 92, and in Slot Machines and Coin-Op Games, by Kurtz, on page 58. Backglass: Diner scene similar to the TV series Happy Days. In the foreground is The Fonz shooting pool. Playfield: Asymmetrical layout with three jet bumpers just below the top rollover lanes. A lane on the left passes to the top lanes. The entrance to the lane has a spinner. The right side has a turnaround at the top. Hitting the rollover button at the top of the turnaround advances the bonus multiplier and then scores an extra ball, and then points. The left outlane features a kickback. Most targets and lanes are labeled with numbered balls, paired as the solid and striped balls. The player must get all seven of a group and then hit the eight ball target. The eight ball target also lights the kickback. Cabinet: Colors are green, orange and black on a white background. The stenciled shapes are a pool player and balls. This machine plays fast when in good mechanical condition. It is even now fondly remembered by many and is considered a collectible machine. Because it is an early solid state machine it used chimes, like the electro-mechanicals for scoring sounds, instead of the later electronic beeps, whistles, and other noises similar to early video games.